and our children really have no idea. My friends, this is information that we need to protect our precious children from a horrible existence and early death. The life of an alcoholic is all too typically a very lonely, deeply depressing, utterly miserable, poverty stricken struggle for mere existence and with little or no hope for the future and NO joy in life. My prayer is for you is to share this information with your children. We had fun getting “cubed” at Flight Deck. About 2 billion people across the world consume alcoholic drinks. Alcohol is the most widely used drug in the United States. Unlike most other drugs, alcohol carries the potential to damage many organs of the body; including the heart, brain, liver, and digestive system. And, when you think about it, damages another organ outside of your body, in the bodies of others who love you, in an organ called the heart. The use of alcohol results in the death of two and one half million people each year and causes serious illness and injury to many millions more. Most deaths caused by alcohol results from injuries, cancer, cardiovascular diseases and liver cirrhosis. Alcohol is also associated with infectious diseases like AIDS, tuberculosis and sexually transmitted disease. This is because alcohol consumption weakens the immune system, reduces inhibitions, and distorts judgment. Of 19 major health concerns, alcohol is ranked #3, and is greater than unsafe water, high blood pressure, tobacco, obesity and illicit drugs (ranked #18). Source: Global Health Risks. Fetal Alcohol Syndrome, is the third leading cause of birth defects with accompanying mental retardation and alcohol is involved in half of all fatal automobile accidents. We cannot even imagine the loss of potential. Research has shown that prolonged periods of drinking produces specific brain damage which causes blackouts, disorientation, and loss of memory. Studies suggest a connection between alcohol and stressors contributing to heart disease. Click here for more. Let’s Get Personal, Because It Is. Jason Jackson was deeply loved by everyone. Over the years, Mrs. Anderson and I have lost many precious friends and neighbors to the excrement Alcohol. Our deeply loved friend and former parent, Jason Jackson, fought on an unlevel field of battle against this powerful drug and its accomplices – ignorance, apathy and prejudice. Because of our misguided tolerance, the ready availability of alcohol contributes directly to millions of people falling victim to its overwhelming seduction and power. Jason knew this deadly excreted chemical was more powerful than he was. We discussed this on many occasions. And as he reached out for help, I found his spirit to be courageous. In my opinion, as a society and as members of the family of man, we have failed our brother Jason and millions more, in not helping to provide a landscape at least partially free from such palpable and blatant temptation. Countless times he reminded me of numerous places all along our streets and highways to purchase alcohol. He told me privately that every time he passed a place where it was advertised and easily available, the indescribable and horrible compulsion of need overwhelmed him. He asked me why? Why is this product available on every street corner and in-between? Many times he asked me how he could stay away from something he was reminded of every few minutes as he traveled along on our streets and highways and even in grocery stores and gas stations. That, my friends, is a very good question. The ready availability of this toxic, debilitating and deadly excrement is responsible for the death of this fine young man – and millions more. As citizens, we hold the power to limit the sale and distribution within our communities. Why are we not actively seeking to help our children, our neighbors and ourselves, in fighting to limit the sale and reduce temptation and exposure to this harmful excrement? The truth is sad. “We, the people” allow lobbyists from the liquor industry to influence those we place in a position of Sacred Trust, those we elect to public office. We, through our blind faith in those we elect, permit the influence of money to overwhelm our capacity for compassion and our common sense. And why do we keep electing these people? Do you think any of our elected representatives will attend the funeral of any one of the victims of alcohol abuse? By not acting and voting in a responsible manner, we contribute to the illusion that there is no problem, while we bury our beloved children out of sight and in early graves, as we continue to drive by the cause of their suffering and demise. How blind are we? How insensitive have we become? How much sorrow can we endure? My, how the tears tears have flowed. Henry David Thoreau said that most men live lives of quiet desperation. Jason lived such a life. He told me he did not own a television because he simply drank all evening until he passed out. And there are countless millions that live as such. Perhaps you passed by one today, living under a bridge or begging on the corner of the street. I ask you today to please remember Jason, and the many, many others who have struggled against impossible odds to free themselves from dangerous drugs such as the bacterial excrement, alcohol. Resolve with me that Jason and all the other countless victims shall not have died in vain. That through you, our other sons and daughters shall have a new birth of freedom – the freedom to live the life that Jason could only dream of, on so many nights, as he wept and prayed for help. When you drink alcohol, it is not casual. It is not harmless. It is serious, especially if you consume this drug in the presence of children, and give its consumption your stamp of approval. The reality of drinking gains a new dimension of acceptability, without the true and hidden recognition of its seductive and highly destructive power. The casual apathy associated with its acceptance as a simple beverage, forms a strong and usually unbreakable bond of relational tolerance that simply should not exist. Any drug powerful enough to change the Constitution of the United States – twice – and destructive enough to cause tens of thousands of deaths on America’s highways and destroy millions of families and lives in associated heath disorders, is too powerful to play with. There is no such thing as a safe level of alcohol consumption. The idea that drinking small amounts of alcohol will do you no harm is a myth. Click here to read more. Liberal guidelines may have kept some people from getting too drunk, but they failed to take into account the growing body of work linking alcohol use with cancer. Click here to read more. I feel that few, if any, will long remember what I try to convey. It is such a tragic realization. But please allow me to wish you strength. And I pray we will all have courage. But more than this, know that I wish you love. May the courage of your convictions, in some way, honor the precious memory of our beloved friend Jason. As I shared with him, when last we met, my prayer is for you to search for the strength to always share the bountiful love that lives in your heart, for in the end, that is truly all we will have left. And privately, I have wondered if the volume of tears shed by all the countless millions affected by the losses we have suffered is not greater than the volume of alcohol consumed by its victims. It was bad enough when Scientific American broke the news that there are ten bacteria cells in or on the human body for each human cell. That we are out-numbered 10 to 1 in our own bodies. That there hundreds of times more bacteria genes as human genes living in and on us. We are made mostly of bacteria. Derek had too much fun. Yeast poop. When you get right down to it, the pseudo happy juice that makes you pass out and makes you fat and irritable, is yeast poop. Yeast eat sugar and drops big, steaming loads of booze wherever they go. And they pass gas a lot too. You may as well stick a straw in the septic tank. The effect will be the same! Click here for more. It is true that alcohol is the name given to the excrement that bacteria excrete, after feeding on fruit/vegetation during so called fermentation (a fancied word for excrementation) ? The gang was excited about adopting a new puppy. amounts. While we may have a few drinks and not feel anything, our body certainly takes notice of the alcohol. The story of how alcohol came to be, … asserts gleefully that fungi in grape juice “gorge” themselves and leave their liquid excrement. That is what alcohol is. Yeast: It Eats Sugars And Poops Alcohol. What’s Not To Like? Yes, we have discovered that alcohol is essentially the toilet water of a fungus. Alcohol is yeast excrement. And here he is! It’s Rosie Junior or “RJ”. Beer, as all alcoholic drinks, is made by fermentation caused by bacteria feeding on the yeast cells, then defecating. This bacterial excrement is called alcohol. The term ‘toddlers’ originated in England. There were impurities in the drinking water that disallowed the water to be used for drinking. A common alternative drink was beer (it was cheep, plentiful and the water used to make it was treated during the initial boiling during brewing). Toddlers, just weaning off of mothers milk were unaccustomed to the effects of beer. This coupled with the fact that they were just learning how to walk really made them toddle. It was the accepted practice in Babylonia 4,000 years ago that for a month after the wedding, the bride’s father would supply his son-in-law with all the mead he could drink. Mead is a honey beer, and because their calendar was lunar based, this period was called the “honey month” or what we know today as the “honeymoon”. Julie show us how exactly to take flight. Many years ago in England, pub frequenters had a whistle baked into the rim or handle of their ceramic cups. When they needed a refill, they used the whistle to get some service. “Wet your whistle”, is the phrase inspired by this practice. Alcohol is made from the excrement of a living yeast organism. When the yeast is fed carbs in the form of grapes, hops, potatoes, corn etc., it digests it and excretes toxic alcohol. On Friday, February 28, 2014, we will meet at 10:15 a.m. at the Military Museum of Fort Worth, 712 Dorothy Lane (Telephone: (817) 386-9498). After our visit to this museum, we will dine at a nearby eatery and then return to school. Pickup will be at school at 2:30 p.m. Please Note: Uniform pants with a belt, & RED monogrammed school shirts are required. PARENTS /GUARDIANS / FRIENDS are always invited to participate on our trips. Comfortable shoes are highly recommended. Dress for the weather. Since its founding, America has been blessed to have brave men and women fighting for her honor. These soldiers give their hearts, minds, bodies and lives to the country they hold dear. Since the American Revolution, they have fought for our freedom and liberty, and their stories have been passed down through the generations. That great history would be lost, though, if it weren’t for other men and women who dedicate their time and energy to keeping it alive. At the museum we can learn about Texas men and women who served their country in WWI, WWII, Korea, Vietnam and the Gulf Wars. Some of the artifacts and memorabilia on display include uniforms, maps, photographs, videos and heartfelt letters home. The uniform jacket of 1st Lt. Audie Murphy, America’s most decorated soldier, is on display across from the German naval flag that Lt. Amon G. Carter, Jr. brought home after he was released from a German POW camp in 1945. The Military Museum of Fort Worth is located in a building that was once a small business just north of Fort Worth’s Cultural District. It focuses on men and women who served in Texas, or served in a unit based in or trained out of Texas for military conflicts since 1900. If you really want to know what it was like to serve in the Marines, the museum has a toy chest full of military gear for people to touch and try on, including a helmet, vest, water bucket, and combat pack. The museum has been in existence since 2008 to preserve the military artifacts and histories of the men, women, and units linked to Texas during the 20th Century. Our goal is to not only honor the veterans, but to use these resources to promote this history to visitors by educating the general public about the contributions and sacrifices of these men and women. Our goals are reached by providing outreach exhibits and educational seminars in venues outside of the museum. The Board of Directors is made up of veterans, historians, and military enthusiasts volunteers from the Dallas/Fort Worth area. FINANCIAL: A $5.00 per student/adult donation to the museum will be collected. Please provide funds for lunch. Parking may be difficult. Please allow extra time. Townes has a lot on his mind. What a singular, beautiful gift our lives can become. From thoughtful, loving moments we gain wisdom, insight into the mysteries of life, compassion for others, and logic to resolve life’s confusion – which can calm our demeanor and provide a reassuring way. Such moments can be yours this day. Allow me to share one treasured time of enlightenment with you. I have thought very long and intently about something Jesus conveyed to his following when he said, “Heaven is within you”. I have truly questioned and reflected upon this astonishing introspection and for over many years. One day we were discussing this beloved quote from Jesus, “The kingdom of heaven is within you.” (Luke 17:21) There came a time when I desperately wanted to know what Jesus truly meant – what was he conveying to us – what could this profound statement really mean – “Heaven is within you”. Ben was so right. I found that Heaven is within you. God blesses each of us with a few moments of Joy in our hearts, as we give of ourselves to others. And I truly believe that in this moment, when we share our joy and our love, Heaven is within you. Your life radiates inner joy and a graceful peace, when it is abundantly shared with others. I have discovered that even unbearable loss can bring us awakening. And I now believe that to open our hearts, we must embrace countless moments of joy and unbearable sorrow. Without sorrow, the heart is hollow. I now know that love, in the here and now, can find hope for a new tomorrow. Our life is as fleeting as a rainbow. And this precious moment truly is the only time and here the only space. My prayer for you is to be happy in this precious moment. Joy is not something we can strive for. It is already here. We are truly blessed and born with it. We never lose it. It is always with us. A smile, a memory, a thoughtful moment and it is here. A loving deed done for someone else, and you are there. Sharing your joy is love. People touched by you in joy are never the same anymore. You can became a source of salvation for others, and in the process, save yourself. The flame of your life can light the pathway for others and they will never be the same again. There comes a moment when love, for all those around you, is like the breathing of your own soul. Your whole being can be transformed into love. You awake and suddenly discover, you are love. And your love becomes tangible and eternal. Live in love, and share that love with those afflicted, who know not the joy of living in love. For there lies one of the truly deep meanings of our lives. There is a deeper reason why life need not suffer to be without love. One day, I patiently studied the breathtaking beauty of but a single wild flower. And as my mind turned to reflect upon the beautiful gifts of life and love, it became clear to me, that God showed us the way. Now, we need but follow. The idea that the Kingdom of Heaven is within us is not only beautiful, it is powerful. Jesus points the way to hidden dimensions, not simply the generally accepted idea of Heaven. He speaks of a completely different inner reality. Perhaps, the consciousness hidden in our hearts upholds all intelligence in the universe. It is deeply personal and serves to bridge us to the sacred. The Kingdom of Heaven lives inside us, if we let ourselves embrace it! The love of God lives inside of us, even though many of us are never in touch with it. Yes, we can connect with the collective unconscious, which emanates from the Source of our being. And in so doing, we are touching a spiritual power much greater than ourselves. Our life is as fleeting as a Rainbow. that ye are in the city of God and ye are the city. We will meet at 9:30 a.m. at Half-Price Books, located at 475 Sherry Lane, north of Ridgmar Mall –Telephone: 817-732-4111. At approximately 10:45 a.m. we will travel to Greenwood’s German Restaurant, 3522 Bluebonnet Circle, – 817.921.6777 to enjoy lunch. Following lunch, we will caravan to Flight Deck located a half mile west of Ridgmar Mall, at the Cherry Lane exit off I-30, at 7751 Scott St. in Fort Worth, to enjoy jumping and acting, otherwise, a little abnormal. PICK UP will be at FLIGHT DECK at 2:30 p.m.
“It is the weak who are cruel. DESTINATIONS: FLIGHT DECK is where massive FUN and fitness take flight! It integrates rebounding (trampoline jumping) along with strength and flexibility training. Reconnect with your inner child and burn up to 1,000 calories in an intense 50 minutes or less. Flight Deck features a mix of aerobics, core strengthening, coordination & flexibility exercises. Students are NOT to leave the bookstore, restaurant or take flight from the flight deck without the approval of Dr. A. He has been known to fake a heart attack if you are missing and it is, well, all a little too melodramatic for Mrs. A. FINANCIAL: The cost for Flight Deck is approximately $11.00 for our one hour – please pay at the Flight Deck. And please provide funds for a good book and for lunch. Refreshments: Yes! We are in awakening times. It was a tearful goodbye to Sia Yoo, visiting student from Korea. We love you Sia! If we, the essence of humanity, can somehow manage to survive past the time when we would self-destruct, past that moment when we could eliminate such things as the hyper-ego of possessing nuclear weapons, then another new world could reveal itself. This existence, this self-awareness, would evolve into another dimension of our own making. It would become what only our imaginations, our deepest desires and our dreams could conceive. It would be beyond our current understanding of ourselves, of what today makes us human and beyond any current reality. But the first step in the next phase of our evolution requires an awareness of who we are – what it means to be human. So let’s explore our unbelievable presence of being or . . . . . . not being. More than 90% of the cells in our bodies are non-human. According to a recent National Institutes of Health estimate, 90% of cells in the human body are bacterial, fungal, or otherwise non-human. Since the inception of the Human Microbiome Project, dozens of research teams have gathered data which redefine what it means to be human. Bacteria regularly engage in “shape shifting” between forms. 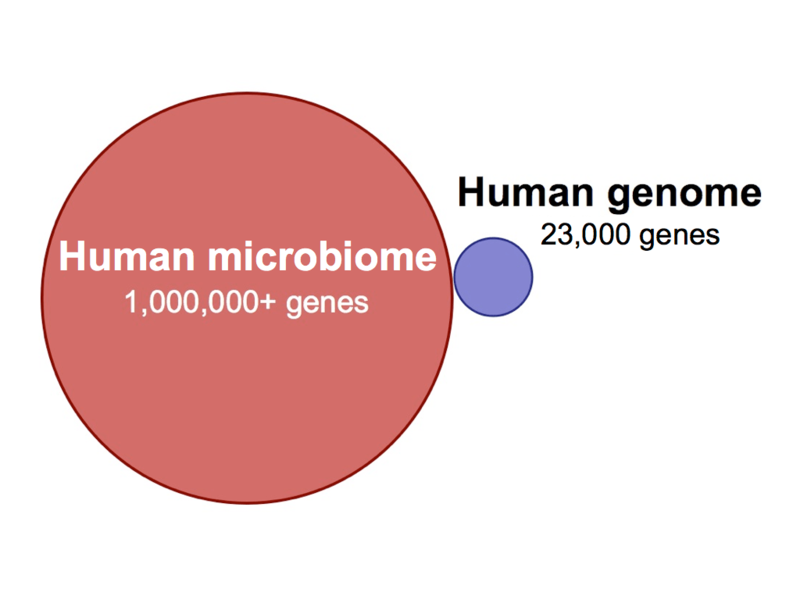 The bacteria in our bodies harbor millions of genes, compared with only 20,000 estimated in the human genome. To say that you are outnumbered is a massive understatement. According to researcher, Jennifer Loveland-Curtze, “Microbes comprise up to one-third or more of the Earth’s biomass”. Click here to read article. These bacteria form a diverse and complex ecosystem with a total gene pool (microbiome) more than 100 times larger than the human genome — in effect we are hybrid superorganisms. Every human body harbors about 100 trillion bacterial cells, outnumbering human cells 10 to one. Human beings are not really individuals; they’re communities of organisms,’ says microbiologist Margaret McFall-Ngai. Humans Carry More Bacterial Cells than Human Ones. You are more bacteria than you are you, according to the latest body census. click here to read more. Humans Have Ten Times More Bacteria Than Human Cells. Click here for more information. We are almost non-existent inside our Mother’s womb. The human body is about 97% water in the early stage of life (leaving 3% that constitutes what can be considered – us) and 90% at birth. The water content in the body of a grown-up person decreases to about 60% (Thank you, burgers & fries!). And amazingly, only 1 percent of the water on planet Earth is fresh water that sustains our life, 97 percent is saltwater (almost identical to us, early in life) ; 2 percent is water frozen in glaciers, until it is released in a few years, after we have converted the remaining trillions of gallons of oil into heat in our beloved automobiles. The substance of the universe is consciousness. Mason loves optical illusions, which become real when he observes them. Prior to that time they are an illusion of illusions. According to current research in particle physics, an atom only appears in a particular place if you observe it or measure it (remember, you are made of atoms). An atom is spread out all over the place, until a conscious observer decides to look at it. So an act of observation, or measurement, creates the entire universe. Click here for video. The nature of reality can be examined through the study of illusion. Saffy is still our gal for President. She will look Great in the Oval Dog House! Presidents have typically landed in a dog house. The concept of substance arose from the philosophy of Aristotle. And from that concept came science’s conception of matter. But the substance of the universe is, in fact, consciousness. And each component of the Infinite is an effect of consciousness. Hang in there, it gets deeper – much deeper. A Buddhist koan tells us, ‘…it is not ever the wind blowing or a flag we see moving – it is only Mind that moves.’ Nothing is true and everything is true because everything is Mind (or forms of Mind materialized). The world is our body – it is as we are. For example, trees are one half of our lungs. They give off oxygen and we contribute carbon dioxide formed in respiration- we breathe in and they breathe out. Folks, we are truly one with the universe. How we regard other people and the events we perceive is a matter of “I” projecting what it believes the experience of ‘the other’ to be a mirroring of Imagination. Ideas sparkling in the light of consciousness, bounced back from holographic reflections of Being. Townes shows Alden how things stack up. If you think you are confused, you may not be the you, you think you are, to be confused. In order to be confused you must be conscious of being confused, not just confused, which, when you think about it, is confusing. Your reality, which includes you, is blinking constantly on and off at all times. Quantum physics has left scientists all over the world baffled, especially with the discovery that our physical material reality, isn’t really physical at all. We, and all other matter, come into and out of existence billions of times each second. Our human brain is designed by natural experience (in order to survive), to sense the “on” frequency. Just as quickly, it blinks “off,” and everything disappears. However, your brain registers and connects only the “on” segments, and thus you have the sense or feeling of your reality being solid. What quantum mechanics reveals is that there is no true “physicality” in the universe, that atoms are made of focused vorticies of energy – miniature tornadoes that are constantly popping into and out of existence. This revelation, that reality comes from a holistic entanglement of immaterial energy waves, stems from the work of Albert Einstein, Max Planck, and Werner Heisenberg. At the turn of the ninetieth century, physicists started to explore the relationship between energy and the structure of matter. In doing so, the belief that a physical, Newtonian material universe that was at the very heart of scientific knowing was dropped, and the realization that matter is nothing but an illusion replaced it. Scientists began to recognize that everything in the Universe is made out of energy. Scientific evidence clearly shows the connections between consciousness and what we call reality and how these can no longer be denied. Click her for more. Reality is a hologram creation. A good example of this is when you go to the movies (to see a “motion” picture”, which is not one continuous movement that you view with your eyes. Instead, there are frames of action strung together and projected one after the other at a fast speed – 24 frames per second used as a standard in movies. In the early history of motion pictures, in 1895, Auguste and Louis Lumière introduced the Cinématographe, a projector that could show 16 frames per second. And in their public cinema, audiences were spellbound by the films of simple movement and action. Today, that is pretty much a child’s toy when compared to MIT’s new hardware which can record at 1,000,000,000,000 frames per second. Fast enough to capture slow motion footage of light waves. Yes, an unbelievable Trillion Frames Per Second Camera Captures Light itself in Motion. Click here to view demonstration video. The human brain connects the individual frames into one continuous movement. Yes, very vivid reflections of our hopes, dreams, and imagination are passing through your eyes at 24 frames per second when you behold the “magic” of a motion picture. A new reality is created in your mind, when your mind observes and becomes conscious of the illusion projected toward you. You can become so taken with the emotion directed at you that you lose track of what you consider to be reality. The key first step in understanding what it means to be human is awareness. I believe that the essence of human life is due to mankind being a spiritual being. We are made in the image of a Spiritual Being. And He is still the Lord of Creation. And what He creates is often through us. What a wonderful expression of love – for mankind to be endowed with such a gift as to become a lord of creation, with all the potential for good. So often we find in the beautifully crafted and insightful words of poets and philosophers the essence of our being, the simplicity of understanding and truth. “What are you waiting to find in me. Haven’t you seen in all I wrote what makes me a man? What I ascetically preserved for you after my death. Reality needs me not. I feel great joy in considering that death is not important at all. Consecrate the word of the person I am, a whole person, a man of soul. That aside, I bear inside me, all the dreams of the world. God gave the peril and the abyss to the sea. But in it, He reflected the Heavens”. “Sad the man, who lives at home, content with his hearth, without a dream, whose fluttering wing, makes the embers glow redder, in the warm fire to be abandoned. He lives because life endures. Nothing in his soul is telling him, more than a root can teach. . . Let the vision in his soul subdue blind forces. if we had it, we would reject it. Yes, the spiritual essence of being so human, so brilliantly imperfect, is inherent within us and it compels us to listen generously and compassionately to others rather than being judgmental. Our spirituality is the essence of who we are. And, like breathing, it is essential to human existence. What we consider to be us may truly be an illusion, and an imperfect one. But the love we feel for one another is palpable, capable of being felt; tangible, real. In fact, it may be the only reality. Perhaps, the illusion of being exists for a reason. Our reason for being, or the illusion it presents, may exist to construct a new and elevated dimension – a world so real it serves to resurrect within us the profound love that gave us life – a love beyond being, beyond mere existence – a love so profound that it moves our reality toward the light of God’s Love. One day the union of our love, with that of our Father in Heaven, may blossom into the Light of Eternal Life. My friends, we are simply not capable of knowing everything. But it appears that the realms of science and theology are rapidly merging. They are, like everything else in the universe, becoming one. The human spirit is the very essence of life in a human being. And knowledge of this can amplify the joy of living and bring about spiritual freedom. You are a spiritual being having a human experience. Your infinite capacity to create, to love, to dream, to forgive and to be aware that you are far more than you can ever imagine, ultimately defines what it means to be human. You are the most beautiful and miraculous creation in the universe. And you are eternal. On Friday, Feb. 14, 2014 we will leave from the school at 9:00 a.m. sharp (o.k., maybe not sharp, hopefully not dull) to caravan to the Doss Heritage and Culture Center in Weatherford. The Mission of the Doss Heritage and Culture Center is to collect, preserve and exhibit the heritage of Parker County and Texas. The Museum offers Parker County’s rich tapestry of cattle barons and cowboys. Broadway and television stars, chuck wagons and stagecoaches shared and showcased in galleries that are truly awe-inspiring and reflects all that is Parker County. Our docent guided tour will begin at 10:00 a.m. Following our tour we will dine at the Whistle Hill Cafe and then return to the Anderson School. Pickup will be at the school at 3:00 p.m. PARENTS / GUARDIANS / FRIENDS are always invited to participate on Friday. Comfortable shoes and clothing are highly recommended for activities on this day. LUNCH: We will dine at the delightful Whistle Hill Cafe. The DOSS CENTER is located at 1400 Texas Drive in Weatherford. Directions from Fort Worth: From Interstate 20 west take exit 408 onto service road, turn right onto Texas Drive off service road. Proceed past shopping center on the left, through the four way stop at Austin Elementary. Go approx. 2 blks north on Texas Drive and the Doss Center will be on the left, on the corner of Texas Drive and Park. We will learn about the famous cowboys who made Texas a name known throughout the country. Rugged men and women who brought the cattle to market by driving them along trails to market forever cementing themselves in the annals of Texas history. The Trail Drivers exhibit opened to the public last year. The cattle drives of Texas represent a critical period in the history of Texas. The drives helped the Texas economy recover and thrive after the Civil War. This exhibition tells the story of longhorn cattle drives and highlights the stories of Charles Goodnight and Oliver Loving. Parker County played an integral role in this legacy. We will learn about Charles Goodnight’s Chuck wagon design and how Loving’s body was returned to Weatherford after he met his untimely death on the trail. Where precocious children are nurtured and appreciate.